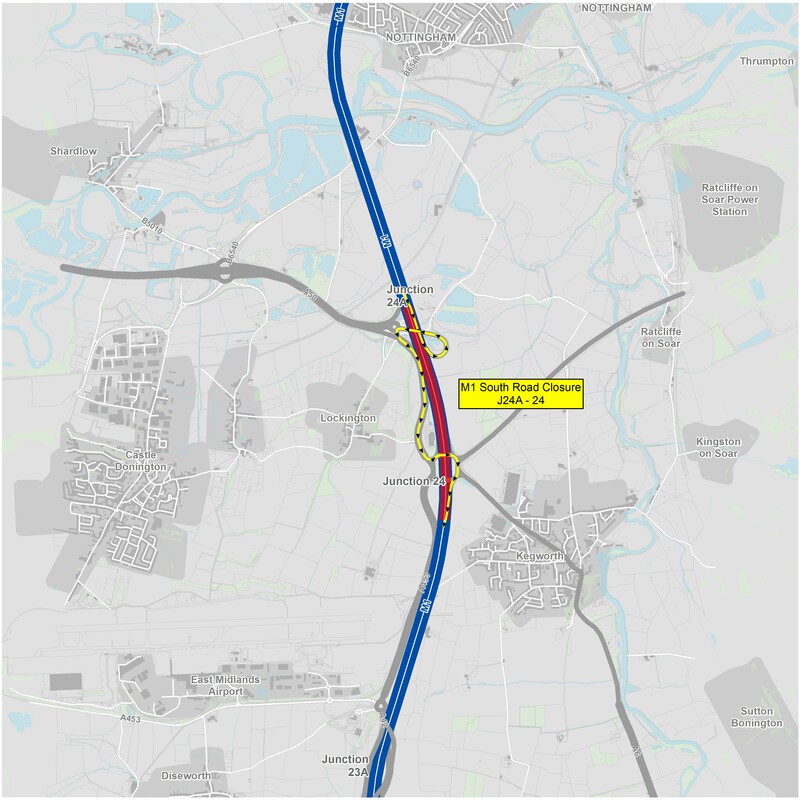 We are pleased to announce that we have opened the second and final phase of the M1 smart motorway to traffic between junction 24 and 25 on Wednesday 27 February. During an overnight closure of the motorway, we removed the temporary 50mph speed limit and remaining traffic management restrictions. This means the smart motorway is now fully operational for speeds up to 70 mph throughout the whole stretch and drivers are already benefitting from smoother more reliable journeys on this vital route. 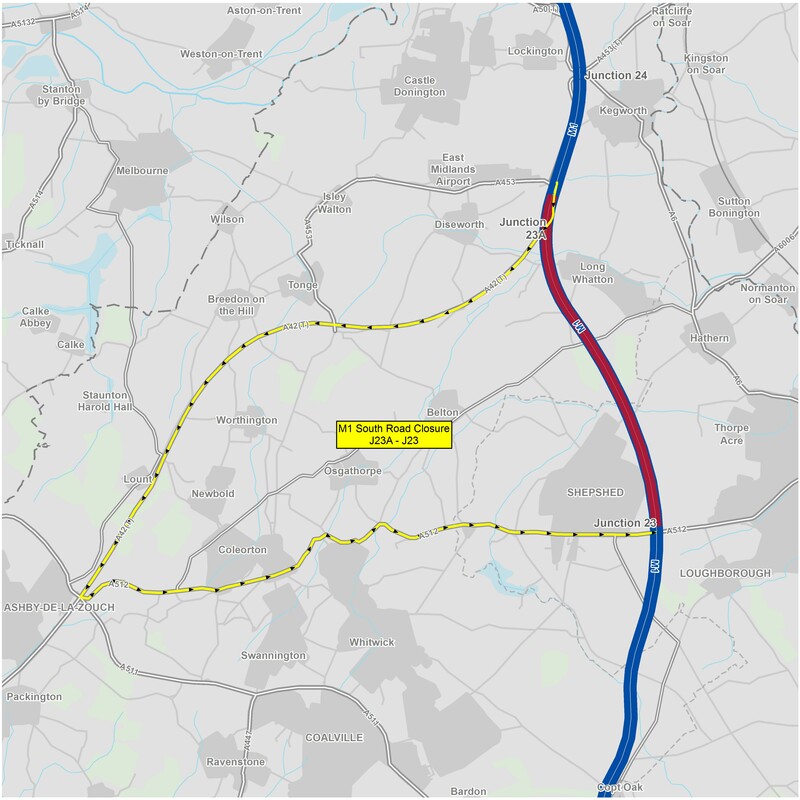 This stretch of the M1 is part of a strategic route between London and the North carrying on average 130,000 vehicles per day between Leicestershire, Nottinghamshire and Derbyshire. 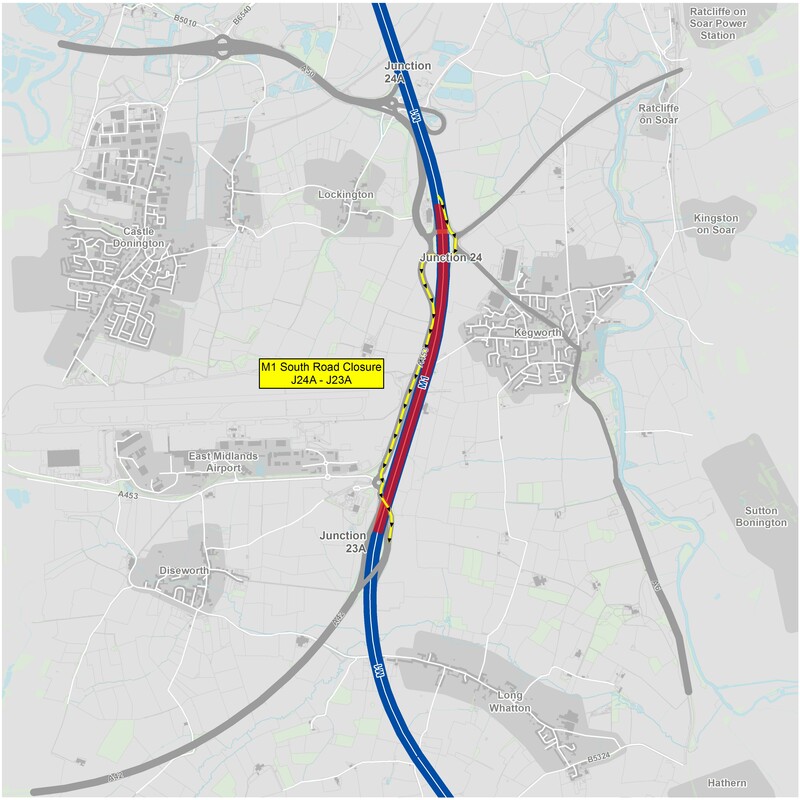 Work began in March 2017 to tackle to the congestion and unreliable journey times that were regularly experienced on the M1 around East Midlands Airport. In December 2018 the first phase of opening took place, introducing variable mandatory speed limits between junctions 23a and 24. This phase also saw the opening of the new lane in both directions between junctions 24 and 25. During January and February, we have been completing the testing and commissioning of the newly installed signs and signals between junctions 24 and 25. The successful completion of this work means we can be sure the technology is operating reliably and it was safe for us to open this stretch at speeds of up to 70mph. As part of the smart motorway upgrade, the scheme has introduced new CCTV cameras and electronic information signs and signals on gantries, which show the variable mandatory speed limits and manage traffic flow and incidents. The scheme will also improve journeys through the capacity we have added, reducing congestion and making journeys more reliable on this vital route. We would like to thank everyone for their co-operation and understanding while works were taking place on this major scheme. There are some minor works left to complete, including areas of resurfacing, replacing lighting columns and installing vehicle restraint barriers. To minimise disruption, we will carry this work out overnight, under lane and carriageway closures. We expect to complete this work by the end of April. You can find details of closures on the planned roadworks tab below. The M1 is a strategic route that carries high volumes of heavy goods and other vehicles. 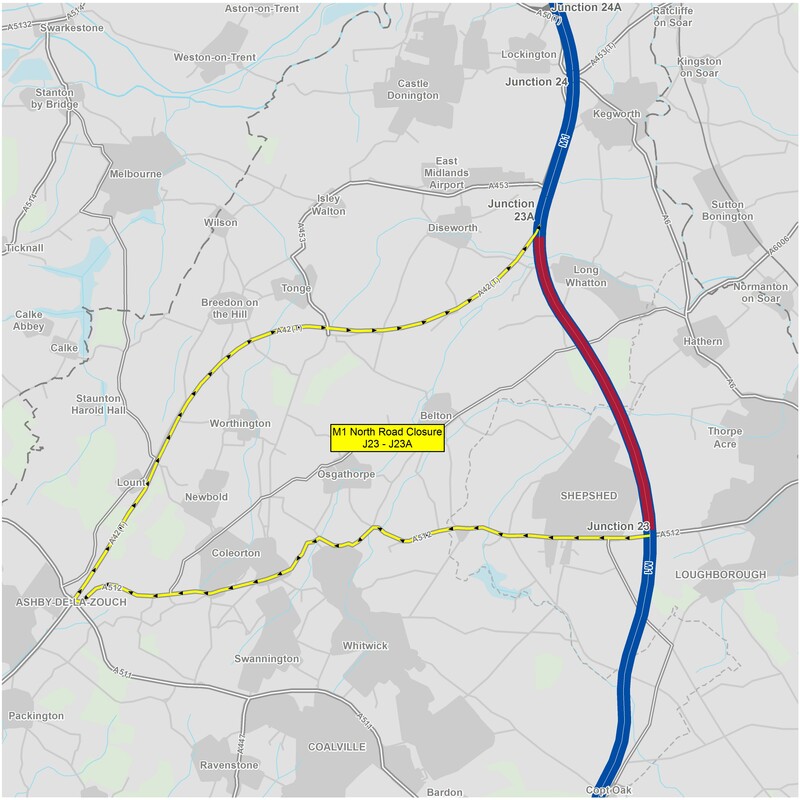 Drivers currently experience congestion and unreliable journey times at busy periods and traffic is predicted to grow, particularly with the growth expected at East Midlands Airport. 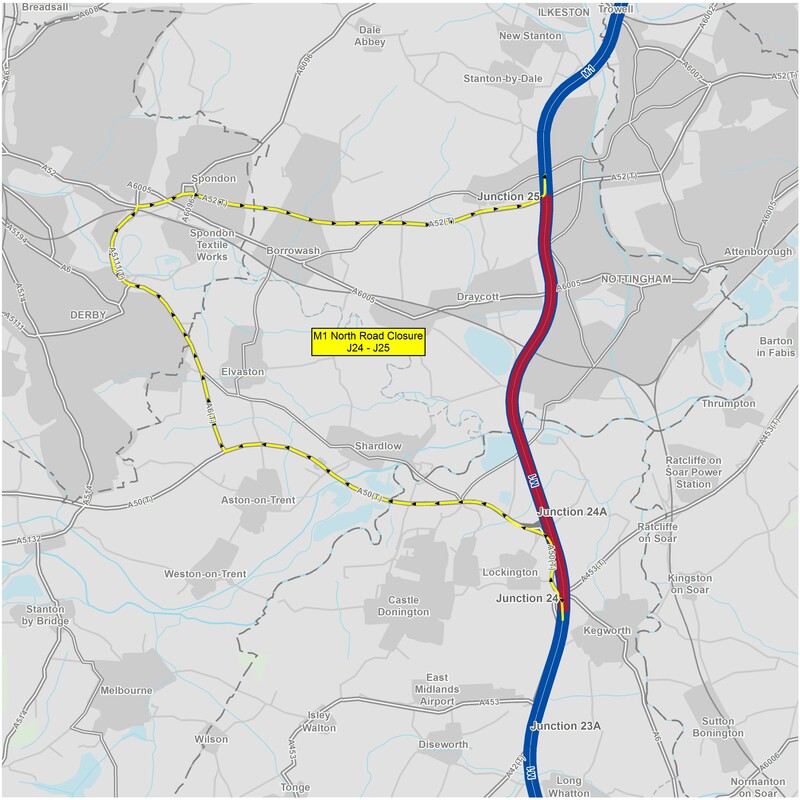 In the 2014 Roads Investment Strategy, the M1 junction 23a-24 was confirmed as committed to extending the previously-announced M1 smart motorway junctions 24-25 improvement to junction 23a (East Midlands Airport). 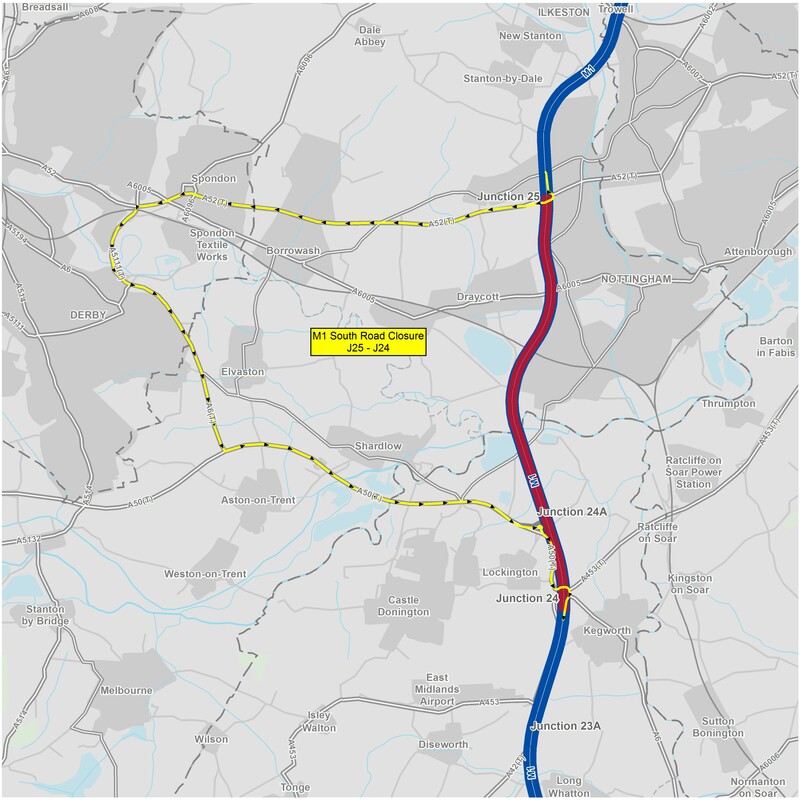 The scheme will convert the M1 into a controlled motorway between junctions 23a and 24 and an all lane running smart motorway between junctions 24 and 25. In total we will be upgrading 7.5miles (12km), which is expected to begin main construction in early 2017 and complete in late 2018. 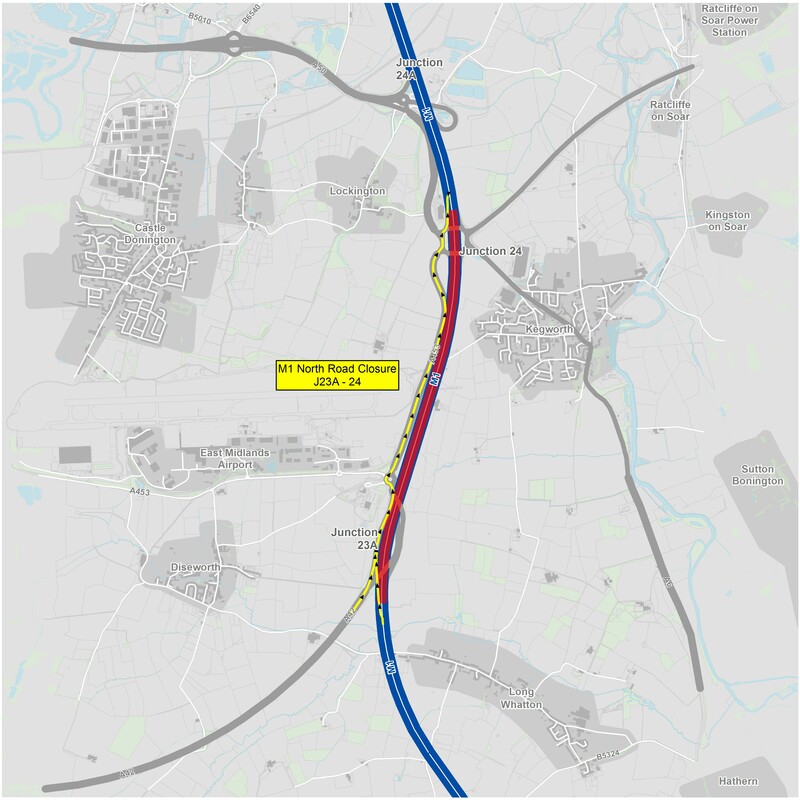 An environmental screening exercise at an early stage of the project indicated that it was considered unlikely that there would be significant adverse effects resulting from the M1 junctions 23a to 25 smart motorway scheme. 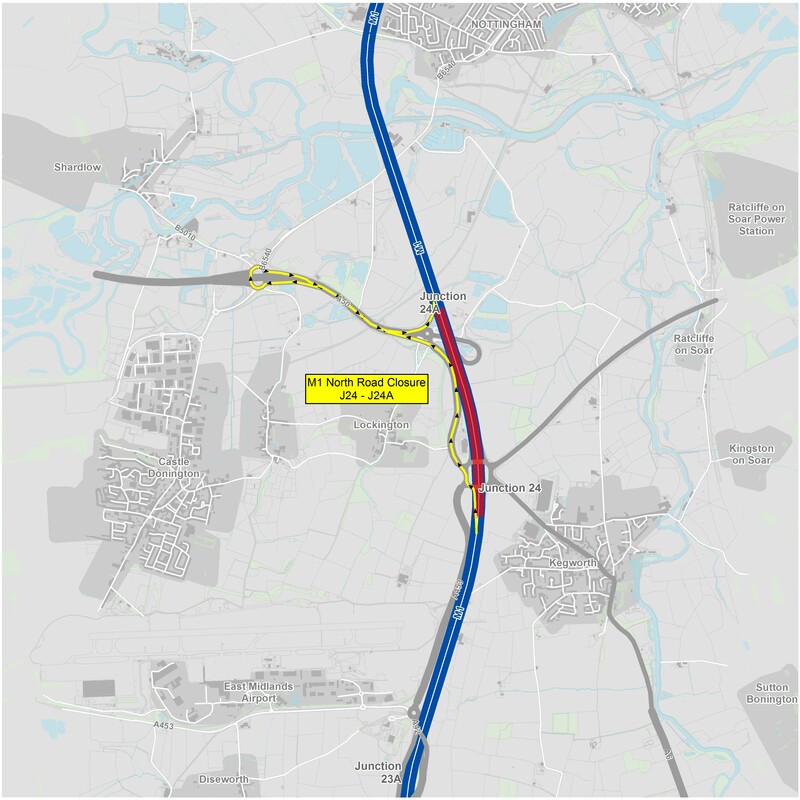 Further investigation undertaken during scoping suggested that as the proposed works are wholly located within an existing motorway, no significant effects are predicted, therefore, a statutory environmental impact assessment (EIA) is not necessary. However, we recognise our duties of care to the environment and communities near our motorways and further assessment was undertaken and reported in an Environmental Study Report (ESR) in order to meet our responsibilities to identify, manage and monitor the effects of all our major developments. Some sections of the existing noise barrier will be replaced and locations for additional barriers are currently being investigated. Location : The A42 northbound between the junctions with the A453 and the M1 . Lane Closures : Lane one will be closed. Reason : Roadworks are planned. Status : Pending. Schedule : Expect disruption everyday between 21:00 and 06:00 from 29 April 2019 to 1 May 2019. Schedule : Expect disruption everyday between 21:00 and 06:00 from 7 May 2019 to 13 May 2019. Lanes Closed : There will be one of two lanes closed. Location : The M1 southbound between junctions J23A and J21A . Reason : Roadworks scheme is planned. Status : Pending. Schedule : From 22:00 on 30 April 2019 to 05:00 on 19 May 2019. Location : The M1 southbound between junctions J23A and J21A . Lane Closures : Lanes 1, 2 and 3 will be closed. Reason : Roadworks are planned. Status : Pending. Schedule : Expect disruption everyday between 22:00 and 05:00 from 30 April 2019 to 3 May 2019. Schedule : Expect disruption everyday between 22:00 and 05:00 from 7 May 2019 to 12 May 2019. Schedule : Expect disruption everyday between 22:00 and 05:00 from 14 May 2019 to 19 May 2019. Lanes Closed : All lanes will be closed. Location : The M1 southbound between junctions J23A and J23 . Lane Closures : Lanes 2 and 3 will be closed. Reason : Emergency barrier repairs are planned. Status : Pending. Schedule : From 21:00 on 28 April 2019 to 05:30 on 29 April 2019. Lanes Closed : There will be two of three lanes closed. Location : The M1 northbound entry slip at junction J24 . Reason : Roadworks are planned. Status : Pending. Schedule : Expect disruption everyday between 21:00 and 06:00 from 25 April 2019 to 27 April 2019. Lanes Closed : All lanes will be closed. Location : The A453 southbound between the A52 and the junction with the M1 . Reason : Emergency roadside drains works are planned. Status : Pending. Schedule : Expect disruption everyday between 20:00 and 06:00 from 26 April 2019 to 28 April 2019. Lanes Closed : All lanes will be closed. Location : The M1 northbound between junctions J24 and J25 . Reason : Roadworks scheme. Status : Currently Active. Period : from 21:00 on 25 April 2019 to 06:00 on 18 May 2019. Location : The A453 northbound between the M1 and the junction with the A52 . Reason : Emergency roadside drains works are planned. Status : Pending. Schedule : Expect disruption everyday between 20:00 and 06:00 from 26 April 2019 to 28 April 2019. Lanes Closed : All lanes will be closed. Location : The M1 northbound between junctions J24 and J25 . Lane Closures : Lanes 1, 2 and 3 will be closed. Reason : Roadworks are planned. Status : Pending. Schedule : From 21:00 on 26 April 2019 to 06:00 on 27 April 2019. Schedule : Expect disruption everyday between 21:00 and 06:00 from 29 April 2019 to 1 May 2019. Schedule : From 21:00 on 3 May 2019 to 06:00 on 4 May 2019. Schedule : Expect disruption everyday between 21:00 and 06:00 from 7 May 2019 to 11 May 2019. Lanes Closed : All lanes will be closed. Location : The M1 southbound between junctions J23A and J23 . Reason : Roadworks are planned. Status : Pending. Schedule : From 08:30 on 2 May 2019 to 15:00 on 2 May 2019. Location : The M1 northbound between junctions J24 and J25 . Lane Closures : Lane one will be closed. Reason : Roadworks are planned. Status : Pending. Schedule : Expect disruption everyday between 21:00 and 06:00 from 1 May 2019 to 3 May 2019. Lanes Closed : There will be one of three lanes closed. Location : The M1 northbound between junctions J23 and J23A . Reason : Roadworks are planned. Status : Pending. Schedule : From 08:30 on 2 May 2019 to 15:00 on 2 May 2019.